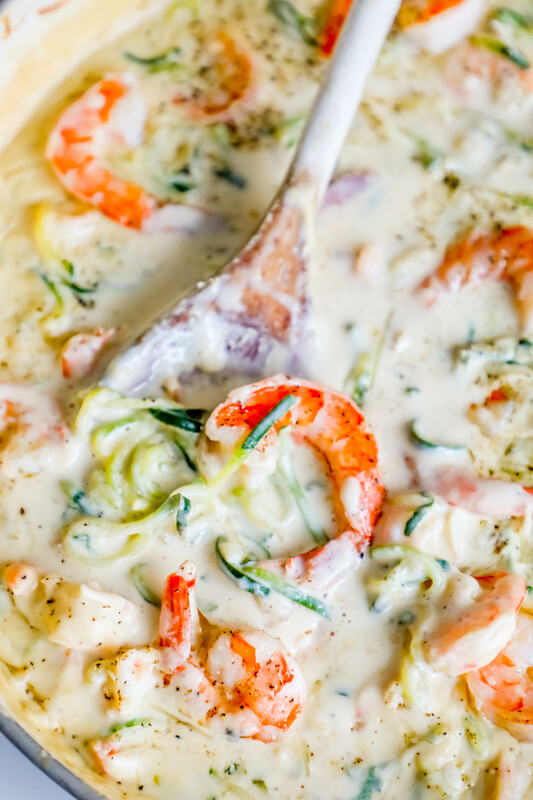 Easy One Pot Creamy Shrimp Alfredo with Zucchini Noodles Recipe is thick, rich, and full of garlicky buttery parmesan flavor in under 15 minutes in just one pot! Low carb and keto alfredo with zucchini noodles has never been easier! I love rich, delicious pasta dishes – but as trying to stick to a lower carb eating plan, I’ve recently fallen in love with zoodles – spiralized zucchini noodles that are a delicious, nutritious swap for pasta in all sorts of dishes. 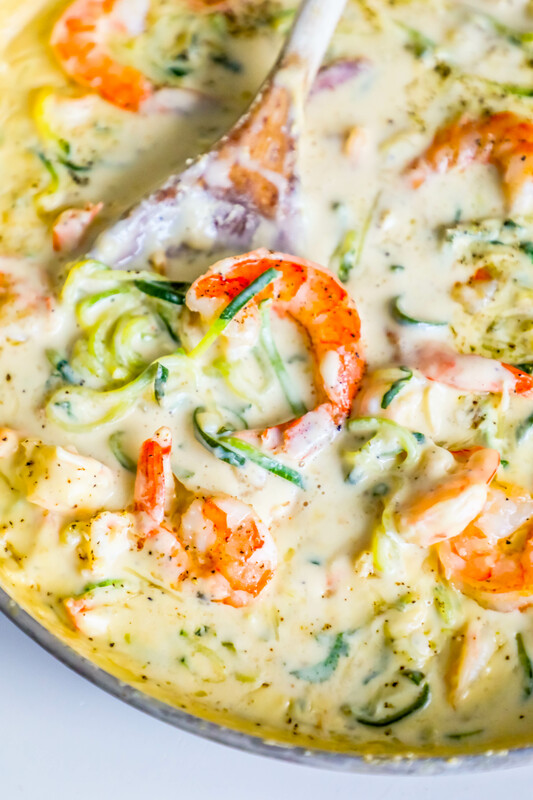 In many dishes, the delicate flavor of zucchini can quickly be overpowered – but with garlic, rich cream and Neufchâtel cheese, and delicious shrimp, it is a fresh and delicious swap for pasta that we can’t get enough of in our house! 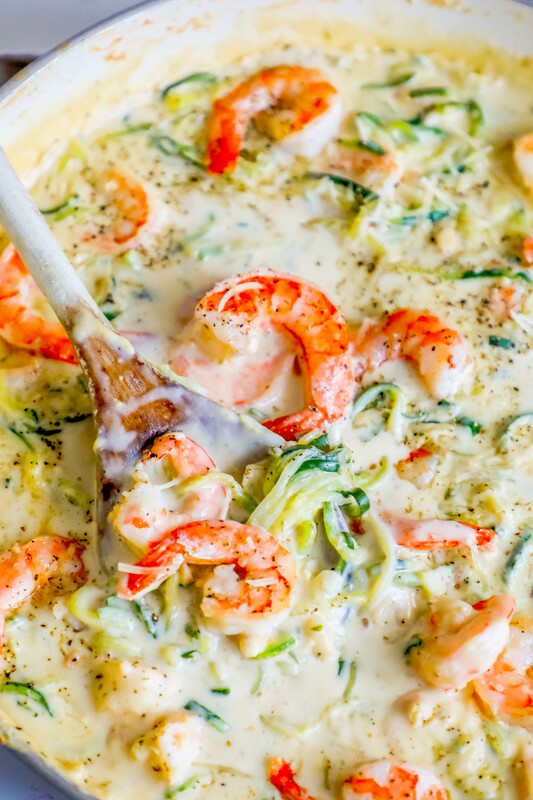 This rich and creamy shrimp dinner is one that is sure to please – and indulge your cravings for a decadent pasta dinner on a low carb or keto diet! 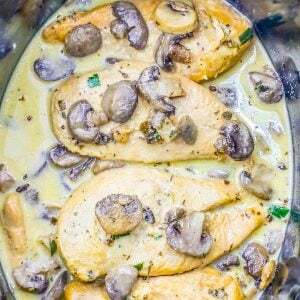 This recipe is even lighter because we’re using Neufchâtel cheese instead of cream cheese – lowering the fat and calorie counts. 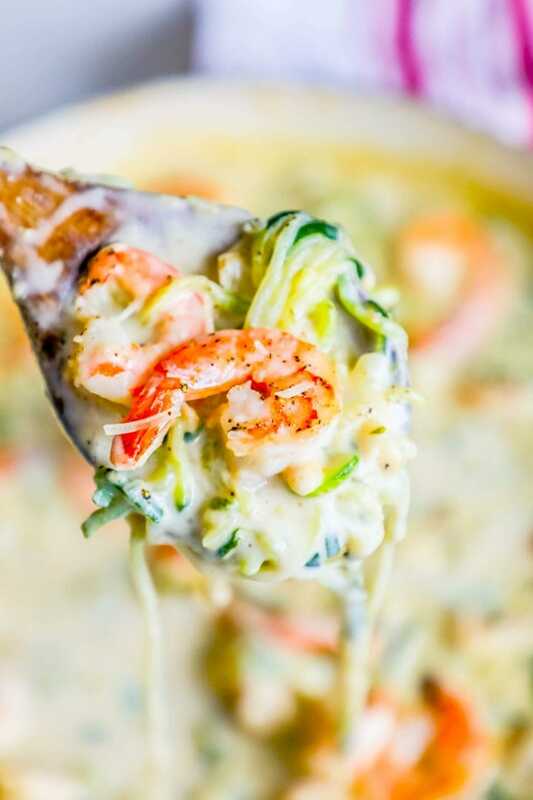 This super creamy and thick creamy shrimp Alfredo with zucchini noodles is a snap to prepare – and so addictive! -A lot of people who don’t like shrimp and think it tastes fishy don’t like overcooked shrimp. When shrimp are overcooked, they taste fishy and have a tough, gummy texture that are frankly gross! 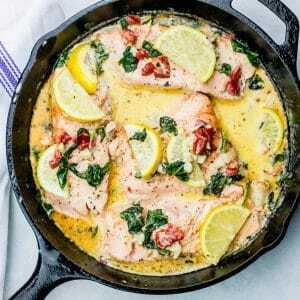 Don’t overcook your shrimp in your alfredo – I personally like to add them at the end and let them cook while the sauce is thickening, and just until they turn translucent and pink – not any longer! If your shrimp starts to curl around the edges, it is starting to overcook. This recipe is a bit more forgiving since the Neufchâtel Cheese alfredo is thicker and harder to “break” (where the oil in the sauce separates from the cream, and even worse, can become lumpy and weird), it is still best to turn heat off of your stove before adding in the heavy cream and then whisk vigorously when adding – that is the best way how to prevent cream sauce from separating! Like shrimp, when zucchini noodles are overcooked, they can have a slimy and weird texture. I like to add them right at the end to heat them instead of cooking them much – when zucchini noodles cook too much they release a ton of water and lose their structure, making them limp, soft, and not very pasta-like. Prevent overcooking them for the most delicious zoodles! Since we’re adding so much cheese, we want to make sure its a snap to clean up – I prefer using ceramic coated nonstick pans since they are a snap to clean! 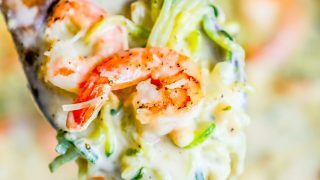 While cream cheese in alfredo can make a rich and foolproof sauce that doesn’t break as often as traditional alfredo, the lighter flavor of Neufchâtel Cheese Alfredo works better with shrimp and zucchini to not overwhelm in this dish. Shredded parmesan cheese doesn’t break down as quickly or as smoothly as grated parmesan, so I opt for finely grated parmesan in this recipe. I prefer to make my own zucchini noodles with a spiralizer – but if you don’t want to buy one, most major grocery stores and health food stores offer pre-spiralized zucchini noodles now! If you love this Creamy Shrimp Alfredo, you’ll love these other deliciously rich and comforting one pot dinners, too! 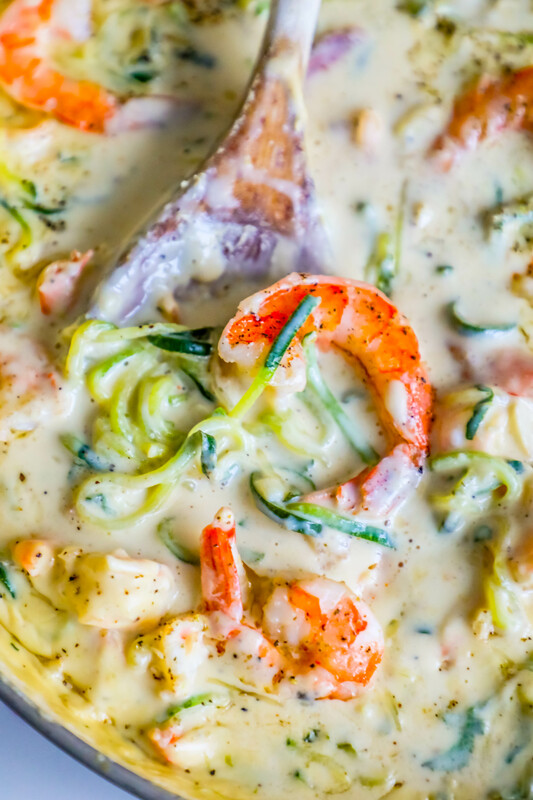 If you love this One Pot Creamy Shrimp Alfredo With Zucchini Noodles Recipe as much as I do, please give it a five star review and help me share on facebook and pinterest! Heat butter in large, heavy pot on high heat until melted and foamy. 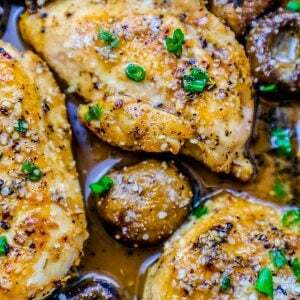 Reduce heat to medium and add onion and garlic to pan, and cook until soft and browned, about 3 minutes. Stir occasionally to prevent burning- watch to be sure garlic does not overheat and smell bitter. Add zucchini and stock to pan and toss evenly, bringing to a rapid boil. Add in cream cheese and melt, stirring often to break it up around the pan. Turn heat off, and add in cream and parmesan cheese, whisking as you pour it in. Turn heat back on to medium high once cream is incorporated, adding shrimp and grated parmesan with it. Cook down until sauce is reduced and shrimp is pink and opaque, about 5 minutes. Do not over cook shrimp. 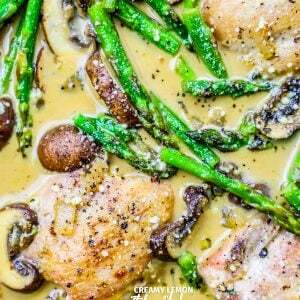 This recipe is fabulous! Made it almost exactly as written except I used regular cream cheese and half-n-half (since that is what I had). Couldn’t have been easier or more delicious. I love my new spiralizer!! Hi! 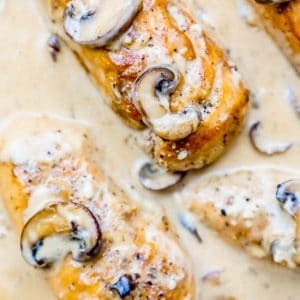 I would love to try this recipe, but I don’t see the cream on the ingredient list, and don’t know how much to use. Could you please let me know? Thank you so much! This looks SO DELICIOUS!! 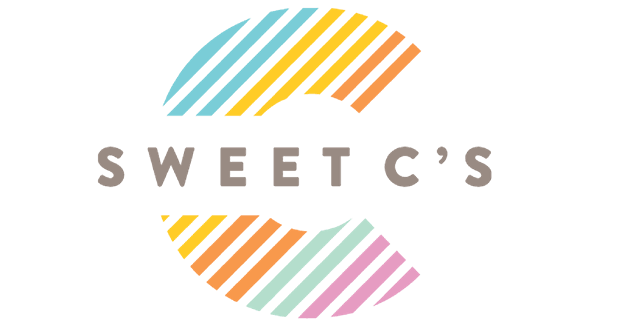 In step five, the recipe states to add in cream although there is no cream listed in the ingredients. How much cream? Is it heavy cream or half and half? I changed recipe plugins and a couple of things must have broken in the change over – it is all fixed now! Thanks for letting me know. It can be either heavy cream or half and half, depending on your preference. Since my husband is following a keto diet I go for the cream so he can get his macros. I changed recipe plugins and a couple of things must have broken in the change over – it is all fixed now! Thanks for letting me know. You gave it a creative name–zoodles. I like zucchini but have never tried zucchini noodles.It is looking so tempting in the pics. Did you make it? I am confused by the the poster’s directions. Why the 5 stars?